1. Preheat the grill to high. Bring the stock and bulgur wheat to the boil in a small pan, stir, then simmer for 3 minutes. Cover, remove from the heat and set aside. 2. Cut the cauliflower into large florets (keeping any tender leaves) then slice them thickly. Place in a roasting tin and drizzle with half the oil. Season then grill for 10 minutes, adding the reserved leaves and tossing together halfway through. Meanwhile, segment the oranges over a bowl to collect the juice. Whisk 1 tbsp of the orange juice with the remaining oil, 2 tsp harissa and vinegar. 3. Spoon 2 tbsp harissa over the cauliflower. 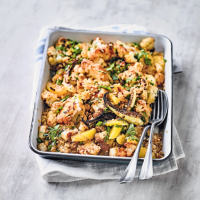 Toss well, scatter with the halloumi and nuts, then grill for 5-10 minutes until the cauliflower is tender. Fold in the bulgur wheat, parsley and orange segments, then spoon the dressing over and serve warm. 306mg vitamin C. 2 of your 5 a day.